Crystal Island – Uncharted Discovery is a fully immersive GBLE where students play the role of a student-selected protagonist who is one of several shipwrecked passengers stranded on a cluster of volcanic, fictional islands trying to establish a village community. The overall goal is decomposed into three distinct sub-problems, or quests, as they are referred to within the game environment, each with two levels. A final quest requires skills and knowledge gained from the first six quests for a total of seven quests in total. The quests are self-contained adventures that challenge the student to complete game-like activities; each focus on landform identification, map navigation, and modeling, respectively, and are leveled based on difficulty. The students are free to complete the quests in any order they please; however, students must successfully complete the first level of all quests before engaging in any of the second level quests. 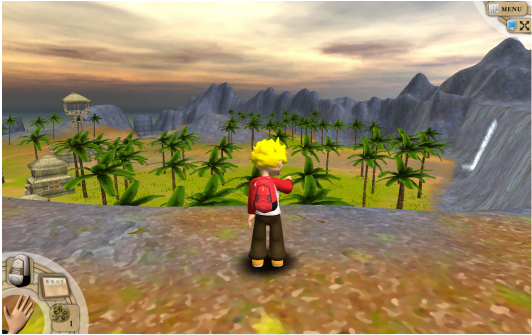 To aid their problem solving, students can seek counsel from map and landform experts who happen to be among the ship-wrecked crew as well as the player’s iPad-like device equipped with note-taking tools, a camera, a log to monitor quest completion and progress, a glossary of key landform and map skill terminology, and a problem-solving application. Nietfeld, J. L., Minogue, J., Spires, H. A., & Lester, J. (2013, April). Girls and games: Examining the performance and self-regulation of girls in a science gaming environment. Annual meeting of American Educational Research Association, San Francisco, CA. Shores, L. R., Hoffmann, K. F., Nietfeld, J. L., & Lester, J. C. (2012). The role of subproblems: Supporting problem-solving in narrative-centered learning environments. In Proceedings of Eleventh International Conference on Intelligent Tutoring Systems, Crete, Greece, pp. 464-469. Lester, J., Minogue, J., Nietfeld, J., Spires, H. A. (2012, April). Tracing the Design and Testing of a Game-based Learning Environment (GBLE) for Upper Elementary Students. Annual meeting of American Educational Research Association, Vancouver, British Columbia, Canada. Nietfeld, J. L. (2012, January). Motivation in an Educational Computer Game Environment for 5th Graders. Annual meeting of Hawaii International Conference on Education, Honolulu, HI. Nietfeld, J. L., & Shores, L. R. (2011, July). A Game-Based Learning Environment to Encourage Problem-Solving and Engagement in 5th Graders. Presented at the International Conference on Learning, Port Louis, Mauritius.